Russian military take-off black polymer set. 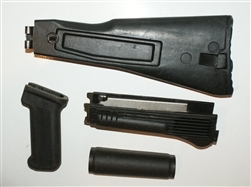 Set includes folding stock (5.5 mm), pistol grip, upper and lower handguards. Picture is a representation only.